“I’d first like to say ‘Thank you,’ to Gerald, (Senior Woman Administrator) Lisa Varytimidis and (Director of Operations) Sara Robson just for giving me the chance to even interview for this position, and then having the belief in me that I can come in and continue the growth of this program,” Stanfill said. While at Louisville, Stanfill tutored Megan Hensley, who was a National Fastpitch Coaches Association All-Southeast Region selection and All-ACC choice after going 17-8 with a 3.35 ERA and 10 complete games for the Cardinals, striking out a team-high 138 batters in 184.0 innings. She returned to her alma mater after a year as the associate head coach at Illinois, where she helped the Fighting Illini to 36 wins—fifth-most in program history—and an NCAA Regional appearance. Breanna Wonderly earned NFCA All-Midwest Region honors after going 16-13 with a 2.85 ERA and 21 complete-games, ninth-most in school history. Stanfill’s first pitching coach job at the collegiate level came at Ball State, where she helped the Cardinals to a 104-61 mark over three seasons, including three straight Mid-American Conference West Division titles and a 2015 MAC Tournament Championship and subsequent NCAA Regional appearance in 2015. With Stanfill as her guide, Nicole Steinbach posted three straight All-MAC seasons and was an NFCA All-Great Lakes Region Third Team honoree in 2015. She also was on staff for two of Jenny Gilbert’s three MAC Player of the Year seasons, including NFCA All-American campaigns in 2013—when Stanfill worked directly with the outfielders in Muncie—and 2014. In Stanfill’s first full-time season as pitching coach in 2014, Ball State’s staff posted a 2.06 ERA during conference play, which helped the Cardinals to the fifth MAC regular-season title in program history. 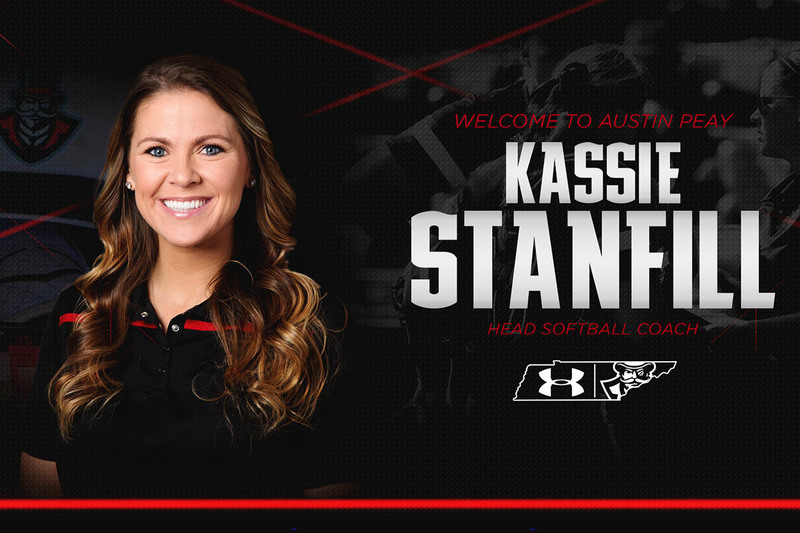 The Goodlettsville, Tennessee, native got her collegiate coaching start in the midstate area in 2011 at Middle Tennessee, helping the Blue Raiders make over their offense with a program-record 41 home runs and a 25-point rise in batting average. Stanfill was a four-year starter for the Cardinals from 2006 through 2009 and served as a two-time team captain. She played several positions throughout her career, splitting time between the outfield and pitcher her first three seasons. After injury forced an early end to her pitching career, Stanfill became the Cardinals’ starting first baseman in 2009. The two-time All-Big East Third Team selection was a .293 career hitter and posted a 27-13 record in 68 pitching appearances with a 2.72 ERA and 227 strikeouts. She still ranks in the school’s career top 10 in several categories including: triples, saves, strikeouts (pitching), lowest ERA and opponent batting average and games finished. As a player, Stanfill helped the Cardinals to a pair of BIG EAST Championships (2006 and 2007) and four straight NCAA regional appearances. Her senior season saw Louisville become an NCAA regional host for the first time in program history. Stanfill earned her Bachelor of Health and Sports Studies from Louisville in 2009 after majoring in exercise science and earned a minor in communications.